Book a winter departure & save $300 per person! Your New Zealand adventure begins with a flight across the Tasman Sea to Auckland, the City of Sails. After your airport transfer to your hotel, explore Auckland your way. An evening welcome reception is followed by dinner with your Travel Director and fellow travellers. After an Auckland city sights tour you’ll trace the Waikato River to Waitomo Caves. Glide through the amazing Glowworm Grotto by boat. Then arrive in Rotorua for an orientation tour. 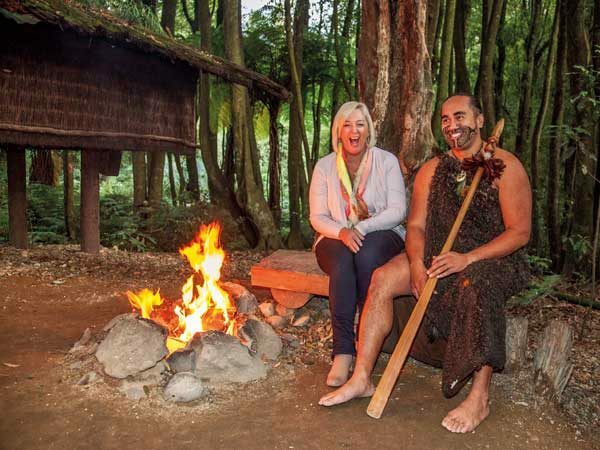 Tonight, enjoy a traditional Maori Hangi feast highlight dinner and concert at the Tamaki Maori Village. Visit the Agrodome Farm Show, then enjoy an afternoon of ‘Free Time’ – visit Rainbow Springs, abundant with Rainbow Trout and native fauna including the kiwi or Te Puia, where a local Maori will guide you through the Geothermal valley with its mud pools and geysers. This morning, depart Rotorua travelling south to Wairakei and on to Taupo, in the very heart of the North Island. Stop to view mighty Huka Falls before following the eastern shoreline of Lake Taupo. Continue through rich farming lands into the capital city Wellington. This morning, enjoy a sightseeing tour of Wellington. Take in the panoramic views from the top of Mt. Victoria. There will be time to explore the Parliament buildings and the Beehive, home to New Zealand’s politicians. Visit Te Papa, the Museum of New Zealand and explore the fascinating exhibits at your leisure. Later, cruise the Cook Strait into Queen Charlotte Sound and Picton. Get up close and personal with some New Zealand fur seals at Ohau Point, watch whales at Kaikoura, (optional scenic whale-watching flight is available) and travel across the Canterbury Plains to Christchurch. Free time to relax this morning. Later see Lakes Tekapo and Pukaki, visit the Church of the Good Shepherd and soak up the alpine scenery of Mt. Cook National Park. Your day starts along the Waitaki River with the Waitaki Hydro Power Scheme and Benmore Dam. Travel through Oamaru with its famous white limestone buildings to Dunedin, where you’ll tour the city. Then you’ve got the afternoon to yourself – perhaps take a Wildlife Cruise, visit the Cadbury Chocolate Factory or ride the historic Taieri Gorge Railway. It’s a morning at leisure, during which you might like to tour New Zealand’s Larnach Castle. Head off across South Otago’s fertile sheep filled farming land en route to Te Anau, on the shores of the largest lake in the South Island. Tonight, you may choose to visit the Te Anau Glowworm Caves. Travel to Milford Sound, where you will cruise on the waters of this natural wonder. See Mirror Lake, Cleddau Valley, the Chasm, Mitre Peak and Bowen Falls. Travel along the Devil’s Staircase and the shores of Lake Wakatipu to Queenstown for a sightseeing tour on arrival. Explore thrilling Queenstown your way – from wine tours to jet boat rides and white water rafting. This evening, cruise across Lake Wakatipu aboard New Zealand’s oldest steamship, the TSS Earnslaw, to Walter Peak High Country Farm for a BBQ dinner at the Colonel’s Homestead. An entertaining after-dinner farm show provides a glimpse into high-country farm life. The first stop is historic Arrowtown. Next is Cromwell to taste its sensational stone fruit. Then it’s a trio of lakes – Lake Dunstan, Hawea, Wanaka before you travel through Haast Pass, view Thunder Creek Falls and take a rainforest walk. Finish your day at the extraordinary Franz Josef Glacier. 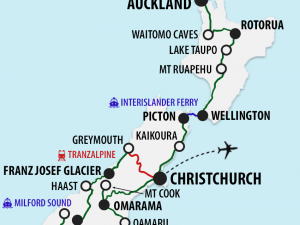 Visit Hokitika, home of the native greenstone (jade), for a factory visit and jewellery demonstration first up then travel to Arthur’s Pass to board the TranzAlpine, one of the top 6 train journeys in the world. 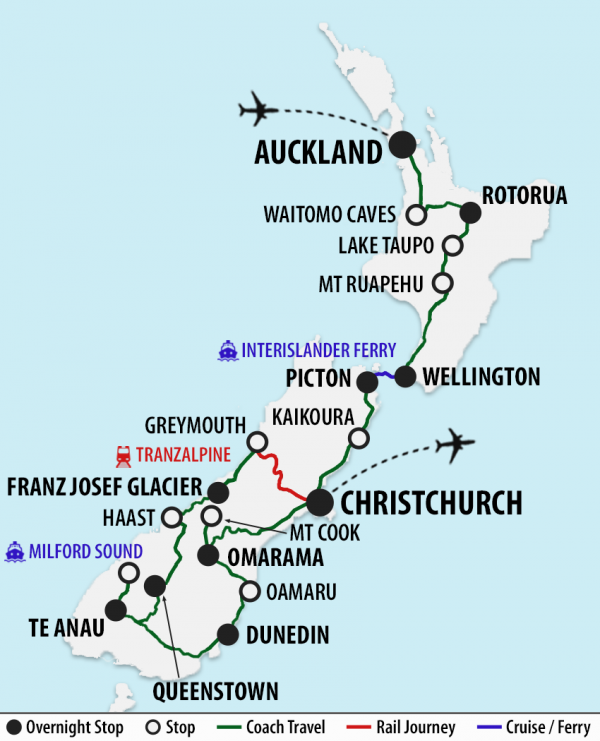 This spectacular journey takes you through the Southern Alps and across the Canterbury Plains to Christchurch. This evening, celebrate your holiday at a farewell dinner. Your holiday concludes this morning after breakfast. You’ll be transferred to Christchurch Airport for your onward flight back to Australia. Flights are included from all departure cities shown as required. These are based on Air New Zealand ‘X’ Class Seat & Bag Economy airfares, Virgin Australia ‘V’ Class Go Plus Economy airfares, Qantas ‘S’ Class Economy airfares or Emirates ‘U’ Class Economy airfares, and are subject to availability at the time of your booking confirmation. Within 20 days of departure – 100% of total booking value.